CHARLOTTE, N.C. (FWAA) – Clemson end Da'Quan Bowers claimed the 2010 Bronko Nagurski Trophy, which annually is awarded to the best defensive player in college football. 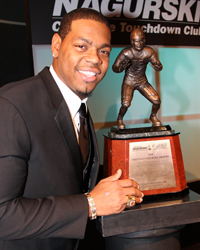 Bowers became the 18th winner of the award as voted upon by the Football Writers Association of America. He received the award on Monday night at a banquet at the Westin Hotel that is sponsored by the Charlotte Touchdown Club. The four other finalists were Auburn tackle Nick Fairley, Georgia linebacker Justin Houston, Boston College linebacker Luke Kuechly and LSU cornerback Patrick Peterson. Bowers is the first Clemson player to be named a finalist for the Nagurski Award since the late Gaines Adams in 2006 when Ohio State linebacker James Laurinaitis claimed the trophy. Bowers wears the same No. 93 that Adams wore at Clemson. The two players were close friends until Adams, who played for the Chicago Bears, sudden death last January in South Carolina. "It’s definitely an honor to be a finalist," Bowers said. "And the honor to actually win the award is the greatest accomplishment I’ve ever done. I'm just so happy these guys thought so highly of me to put me so high in this honor. It was the honor of my lifetime to be selected." Bowers broke Adams' Clemson school record for sacks by a defensive lineman this season week when he had a sack at Florida State late in the season. He also broke Adams' record for consecutive games with a sack, with nine straight in 2010. Bowers' father, Dennis, passed away in the summer before the season. The two had bonded during the summer playing in a rock band on the road. "I have dedicated this year to my dad," Bowers said during the season. "We had many talks on the road this past summer about being in the best shape to improve my quickness and doing all the little things to have a great season in 2010." "I’m so proud for DeQuan," said Clemson head coach Dabo Swinney, the keynote speaker at the banquet. "This is a young man when we sat down and talked how to get from good to great, he just bought into everything. He sold out, changed his body, grew mentally and I'm so proud of him. It's an example of what great talent, great work ethic and perseverance can do." Bowers, a 6-4, 275-pound junior from Bamberg, S.C., is a big-play pass rusher who led the nation in quarterback sacks with 15.5 (1.29 a game). He was second in the country in tackles for loss with 24.5 (151 yards). He had nine tackles, one quarterback sack, two tackles for loss and a pass interception in the Tigers' 16-13 loss to Florida State. Bowers' efforts certainly mirror the person for whom the trophy is named. The Bronko Nagurski Trophy is given in memory of the legendary Nagurski, a former All-America lineman at Minnesota (1927-29). Nagurski was a farm boy of Ukrainian and Polish stock who developed his body by pulling a plow. He was discovered, legend has it, by Minnesota coach "Doc" Spears, who stopped by a farm field in International Falls, Minn., near the Canadian border and asked directions from a big kid plowing a field without a horse. The kid showed Spears where he wanted to go by picking up the plow in one hand and pointing it in the direction Spears was heading. Nagurski dominated college football at Minnesota as a bruising fullback and defensive tackle and could have been an All-American at any position. He then became a star for professional football's Chicago Bears in the 1930s. Notre Dame defensive tackle Mike McCoy received the Bronko Nagurski Legends Award presented by CSX Intermodal. McCoy was a member of the FWAA's 1969 All-America Team. Each year, a top defensive player from a past FWAA team is honored at the banquet. The Bronko Nagurski Trophy is a member of the National College Football Awards Association (NCFAA). The NCFAA was founded in 1997 as a coalition of the major collegiate football awards to protect, preserve and enhance the integrity, influence and prestige of the game's predominant awards. The NCFAA encourages professionalism and the highest standards for the administration of its member awards and the selection of their candidates and recipients. For more information, visit the association's official Web site, ncfaa.org.